This is an exciting development in playing with your VKC Dog. It looks and feels more like you are interacting with your dog than ever before. The video says more than I can ever say in words about it. Take a couple of minutes out to have a look! 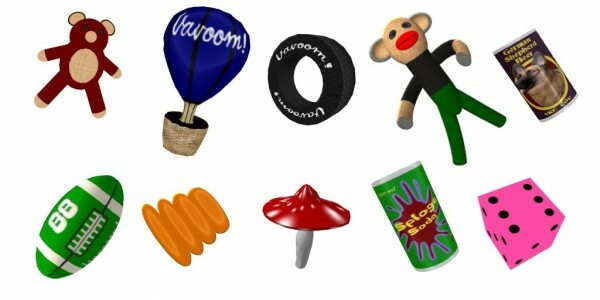 *Active toys* – these are the ones that you put onto the ground and leave. Within a few moments your dog (or one of your dogs) will come over, take the toy and start playing with it. The dog will play with the active toy for a while and then come and give it to you, or maybe to another person or once in a while to another dog. *Magic Toys* – These are the ones that you put onto the ground and touch (or drag around), the toy then displays a menu of dog names. When you choose a name, the dog goes over to the toy, takes it, brings it to you and drops it. The *Squeaky Magic Toys* are similar to the *Magic Toys* because you play with them in the same way, but they squeak when the dog is carrying them and when the dog drops the toy. There are also the *Magic Canned Drink* Toys which you touch like the *Magic Toys* and when the dog brings you the can, he/she throws it to you.. you catch it and drink!